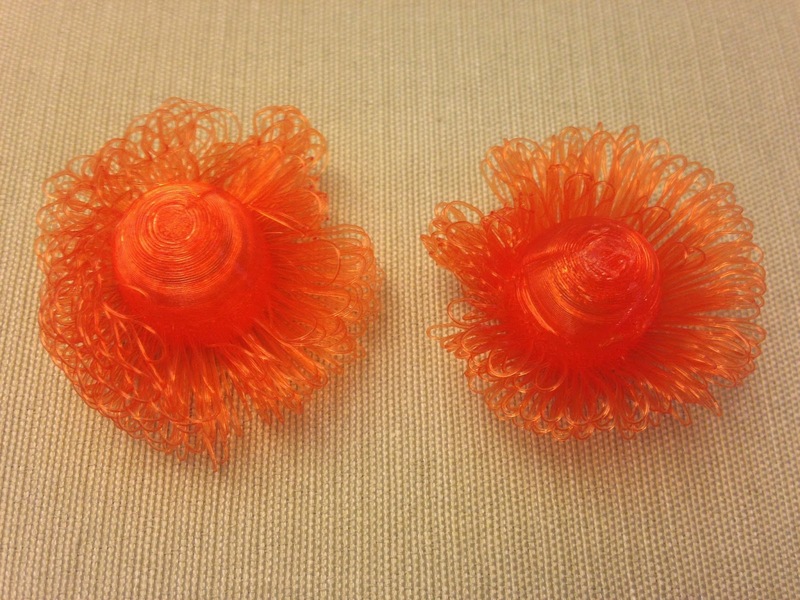 Today we printed peetersm's Customizable DrooLoop Flowers on Thingiverse. The one on the left has the "windswept" look that he describes in his fan control video, caused by the printer fan blowing the strands to the right as they cooled. The one on the left was printed with the fan off, which helped a lot but which made the model generally too hot and gloopy as it printed. Settings: MakerBot Replicator 2 on the recommended .2mm/standard layer height for this model. I couldn't figure out how to turn the fan off for just the petal loops (I could have it start off and then turn on at a specified layer, but I needed the opposite), so for the second flower head I made a custom profile where the fan was off all of the tie. Technical notes, printing flavor: Here's a video showing the ingenious way that this model is printed; the flower head is printed upside-down, like a cup, and then the printer nozzle swings loops out into empty, unsupported space and back again. It's great fun to watch and makes really organic-looking shapes. Normally printing an unsupported overhang would cause a failure, but here that failure is built into the design itself. Technical notes, musical flavor: To swim underwater and not get wet, let Parliament show you how to Aqua Boogie. BONUS FAIL: I'm completely failing to keep up with time, and posted this over a week late! We move on July 1 and hopefully after that I can be caught up and on track each day. If you're reading this in the future when I'm already caught up then please pretend that this paragraph isn't here and that everything was posted in a timely fashion every single day.